Are windows necessary for a garage door? Windows are not really needed for a garage door, but they add aesthetic appeal and are made in a way that doesn’t compromise in the security. There are no drawbacks to installing windows on your garage door. What kind of garage door is safe for me and my family? Garage doors are one of the heaviest moving objects in your home. Our experts in Belmont suggest picking a door that is built with proper safety features. These safety features will help ensure a safe environment for everyone in the home. What are the consequences of damaged pulleys? Garage door pulleys are important for extension spring systems and the operation of cables. Damaged pulleys will jam the door, won't allow it to open and close properly. 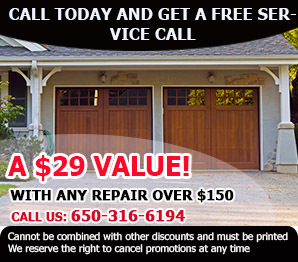 According to the experience of Garage Door Repair Belmont the door will not close all the way, will reopen, and could result in stickiness and noise. How do we choose the right spring system? There is torsion and extension garage door springs but still some differentiations among them. It will depend on the garage system. It will depend on whether you have a high lifting or standard system. It will get easier if you know the height and weight of the overhead door.